The gracious and ornate lace pattern that adorns the top and bottom of this wedding invitation style, was taken from an old piece of hand made lace from a rural French antique shop. It overlays a delicate diamond pattern that is often found on brocade fabrics. The hand-crafted script letters have a casual, relaxed rhythm to their forms, and the accompanying text in italic letters allows you plenty of space for your information. This elegant and lovely style is available in a number of beautiful, rich and pastel colors. 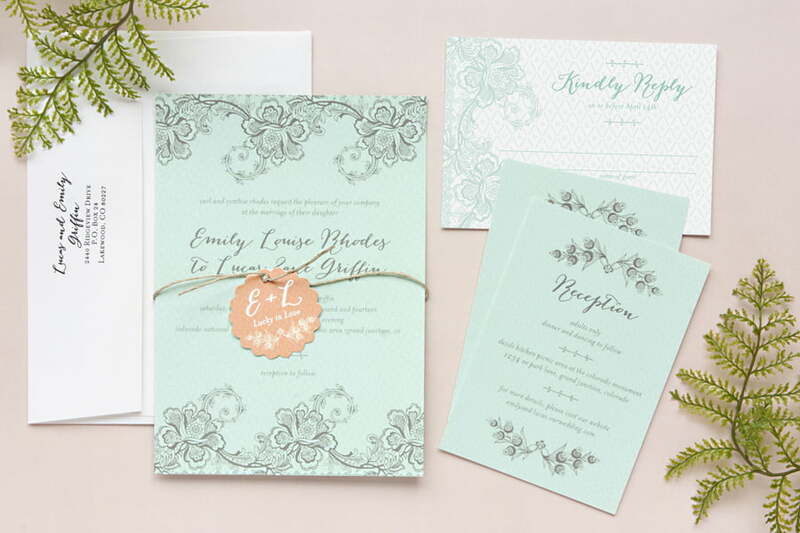 Customize your Lucky in Lace wedding invitations to match your perfect wedding theme today! 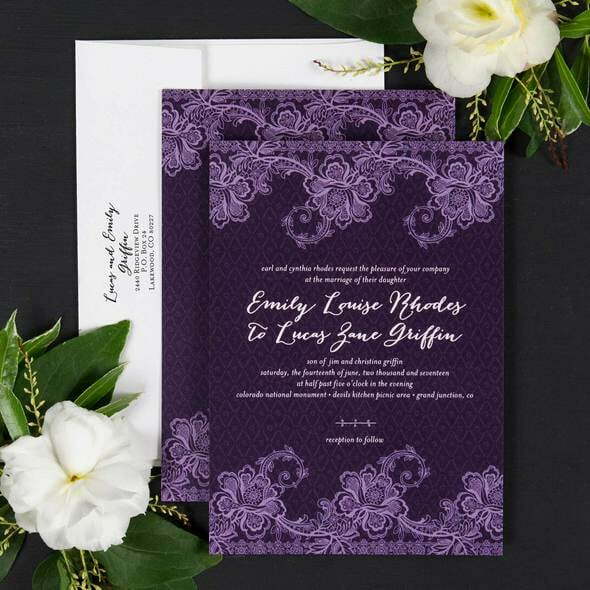 Evermine Lucky in Lace wedding invitation styles are individually designed by our brilliant creative artists and are personalized by you with your choice of color, design, and your words. Wedding invitations are printed in full color on your choice of four different papers. 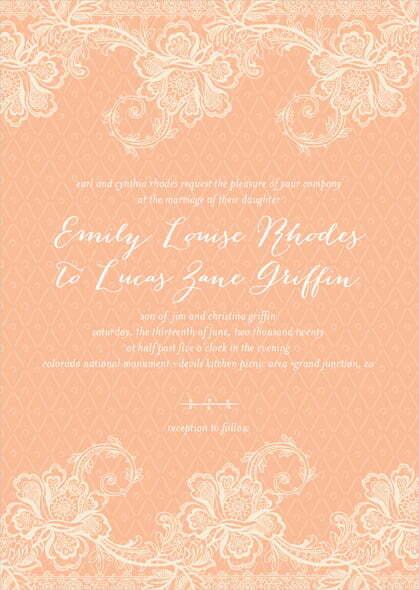 All invitations are flat cards measuring 5" x 7" and have a number of edge trim options as well to embellish. 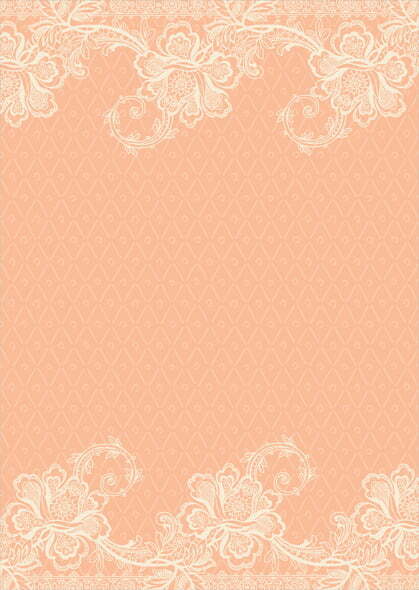 Lucky in Lace wedding invitations are also printed on the back with a matching design. And our wedding invitations come with matching envelopes with the option to have your return address stylishly printed in a matching font, on the back flap. They come beautifully packaged in their own box. Everything about our wedding invitations is done with care and love. You will not find another shop where the attention to detail is so meticulous, and where the invitations are so lovingly and beautifully created.